Why should I buy my replacement parts from Kluge? When you buy replacement parts directly from Kluge, you are buying the exact same original part we used to build your original equipment. This means that the same precision and quality standards have been met before they leave the door. 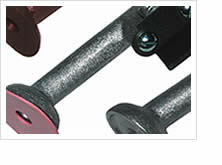 Kluge is proud of the fact that its parts are made in the USA and manufactured at its facility in St. Croix Falls, WI. Our current parts coordinators have been with Kluge for many years. With thousands of satisfied customers across the globe, you can be sure that you can buy your parts from Kluge with confidence. Whether you are looking for suckers or a replacement bottom gauge band for your press or a drive belt for your folder/gluer, our guys know the equipment inside out, and will go the extra mile to make sure you get the part you need when you need it. In fact, customers regularly remark, “Kluge has always been very responsive”. Parts orders received before 2pm will be shipped same day for next day delivery. Orders after 2pm will be shipped the next business day.